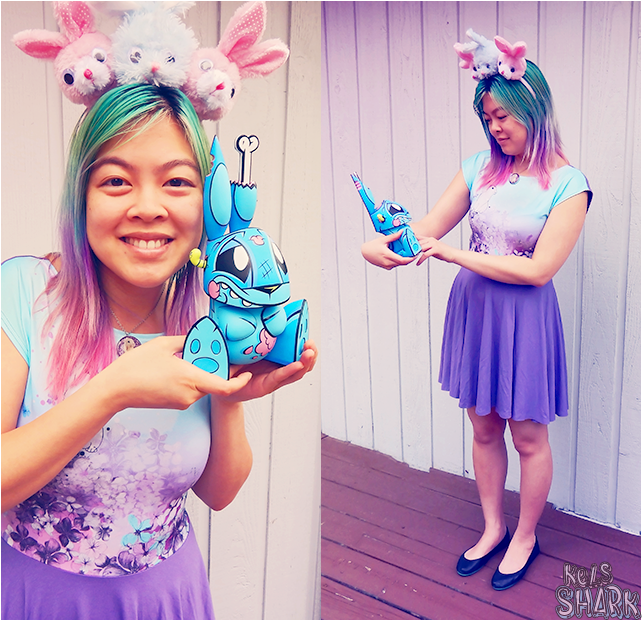 Kels Shark: Outfit: Bunny Bunny Birthday! Yesterday, I turned 27. Thamires (one of my best buddies) is just a week older than me. When we chatted last night, she confirmed that this means we are officially entering our late twenties. Yikes! Tal and I started celebrating a few days early with lunch at Din Tai Fung and ice cream from Molly Moon's! 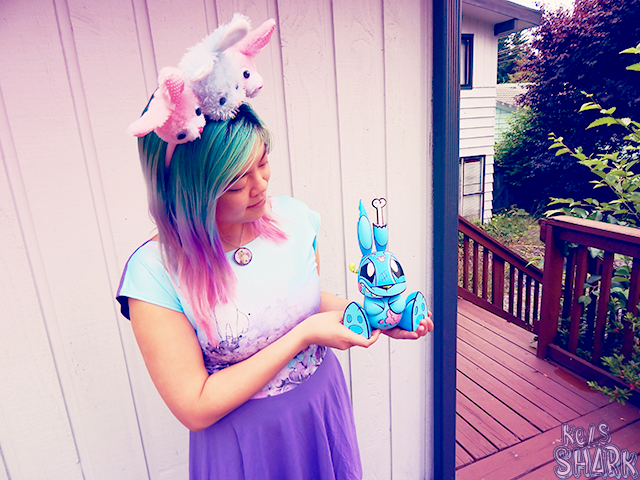 decided a bunny theme would go perfectly with my new dress, a birthday gift from Tal. We snapped a few pics with another birthday gift from Tal. Oh zombie bunny, it was love at first sight! Can you spot all six bunnies in the pics (seven if you count me, a bunny per the Chinese zodiac)? Everything I wore was from shops/artists I love and have purchased from multiple times, so I wanted to share a little bit about each of them! Anyone who has hung out with me over the past few months has probably heard about ZIB, my latest Etsy shop obsession. It's rare that any clothing brand produces products that are consistently comfy, cute, flattering, and easy to care for (let's be real - I rarely bother with hand washing or dry cleaning). Enter ZIB! I guess wearing my fox dress all winter and then my space diamond leggings or alice dress all spring were pretty big clues to Tal on what I'd like for my birthday... heh. 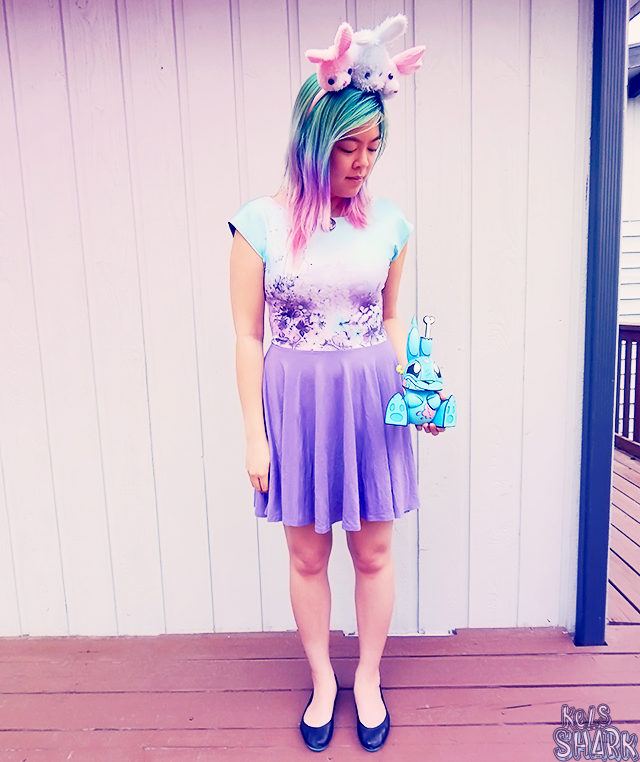 The first present I opened was this beautiful wonderland hydrangea dress from ZIB's latest collection! He also gave me a skirt and pair of leggings that I'll probably feature in another post. Here's a little tip: you can use ZIBENS for 10% off your entire ZIB order. I had the hardest time finding a pair of flats that stayed comfortable for more than half a mile of walking. No matter how cute they were, I never ended up wearing them much. Then I found Tieks, a company that makes foldable ballet flats. Their flats are in a higher price range than I usually dole out for shoes, but with their generous return policy, I thought I'd give them a try. Never going back to any other flats! So comfy and I've worn each pair so much that they've been worth the investment for sure. These matte black flats are one of my favorites, since they basically go with everything. A few years ago, I headed to the Seattle Art Museum. Inevitably, I ended up in the gift shop... and that's where I came across Joe Ledbetter's zodiac animals vinyl series. I was instantly hooked! I ended up ordering the entire set (I'll share them on here someday, plus some other Ledbetter products I own). All of his art is so cute, so awesomely comic-styled, and so colorful. I love the crisp outlines! Plus, he doesn't shy away from dark-cute, like squirrels with bombs or adorable zombie bunnies. The shark-lover in me definitely respects that. SOOO I've been eyeing the Chaos Bunnies since they were released last year. I finally got to see my fave bunny in person, thanks to Tal! 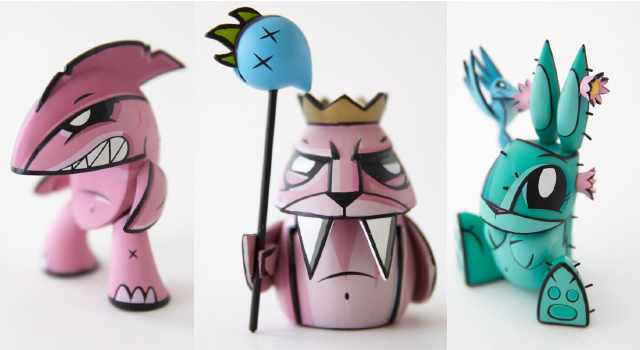 The Chaos Bunnies are made by Loyal Subjects, whom I had not heard of until this collaboration. I, of course, checked them out, and their site is full of temptation... so many deliciously cute designer toys! My bunny is very well made, so I can attest to the quality of their vinyl figures. Plus, they focus on working with artists to create high quality collectibles to life. Definitely a mission I support! Want to see more outfit posts? Check out my outfits page! Note: All non-watermarked images in this post belong to the owners linked above each image. Happy birthday! I love your outfit. And Shana Logic is the *best*! I have sooo much stuff from them. YES I LOOOVE Shana Logic! Especially b/c Shana is pretty much the sweetest person I know!